There a currently five officially classified dwarf planets in our solar system. They are Ceres, Pluto, Haumea, Makemake and Eris. Ceres is located inside the asteroid belt between the orbits of Mars and Jupiter, while the other dwarf planets are located in the outer solar system in, or near to, the Kuiper belt. Another six objects are almost certainly dwarf planets, but are waiting for official classification, and there may be as many as 10,000 dwarf planets in the solar system. 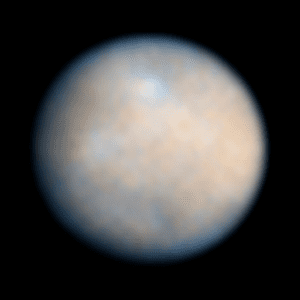 This definition of a dwarf planet differentiates it from a planet on two criteria: unlike the dwarf planet, a planet has cleared the neighborhood around its orbit, and the definition of a planet does not include the satellite distinction. The largest dwarf planet is either Pluto or Eris, followed by Makemake, Haumea and Ceres being the smallest dwarf planet. Currently it is believed that Pluto is the largest but we will know more once the New Horizons mission by NASA reaches Pluto and beyond sometime in 2015. The order of the dwarf planets from closest to the Sun outwards is Ceres, Pluto, Haumea, Makemake and Eris is the furthest from the Sun at 96.4 astronomical units (AU) – almost 14 billion km (9 billion miles) away. Explore the many facts about each of the dwarf planets by clicking the images below. The enormity of the impact of this distinction between a planet and a dwarf planet had an immediate victim. With the new definition, Pluto, which from its discovery in 1930 up until that year was considered the ninth planet in the Solar System, would now be stripped of that position and become a dwarf planet. The main reason that relegated Pluto to the dwarf planet status is that its orbit is riddled with other celestial objects that crisscross its path around the Sun. These objects include other celestial objects in the region outside the planet Neptune known as the Kuiper Belt. Pluto and Eris, another dwarf planet, are actually part of the Kuiper Belt. In fact, the orbital paths of Eris and Pluto cross each other. In comparison, the orbits of the remaining eight planets do not contain other celestial bodies, and they never cross each other’s path. Pluto’s status as the ninth planet in the solar system began to unravel in August 1992 when astronomers at the University of Hawaii discovered more than a thousand objects orbiting the Solar System beyond Neptune. 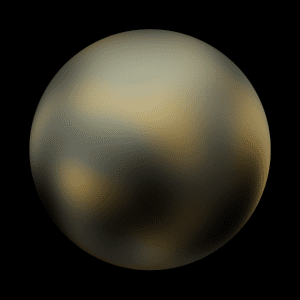 These objects were given the name trans-Neptunian Objects (TNOs). They were of varying sizes and those that had been detected were smaller than Pluto. 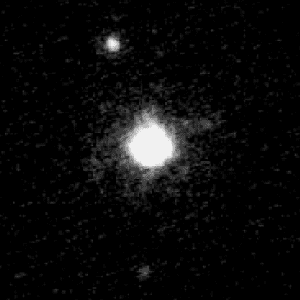 However, on October 2003, astronomers at the Palomar Observatory in California identified a new trans-Neptunian object that was more massive than Pluto. This object also had a satellite and was initially named 2003 UB313. The discovery of 2003 UB313 led astronomers to believe that more of these massive objects existed. It also made them question whether 2003 UB313 could be considered a new planet or not. The important question of what makes a celestial object a planet led the IAU to form a committee that was tasked to gather the opinions of professionals from a wide range of interests including astronomers, educators, writers and planetary scientists. Based on their opinions, the committee created a draft resolution on the definition of a planet. This draft proposal was then presented during IAU’s 2006 General Assembly in Prague. After much debate from its members, a revised version was then put to vote during the Closing Ceremony. By the end of the General Assembly, the members had approved Resolution B5: Definition of a Planet in the Solar System. The Resolution also included the definition of a dwarf planet and thus created a new class of celestial objects that was distinct from planets. The Resolution automatically made Pluto a dwarf planet. After the Assembly, 2003 UB313 was given the name Eris. Pluto, Eris and Ceres (an asteroid in the asteroid belt between the orbits of Mars and Jupiter) were the first members of the dwarf planet class. There are currently five recognized dwarf planets, with Makemake and Haumea joining the first three members. The resolution that led to the classification of Pluto as a dwarf planet was not without its share of controversy. Some planetary scientists objected to the third criterion of the Resolution because they believed a planet, and therefore a dwarf planet, should be judged based on its intrinsic qualities and not what is or isn’t in its neighborhood (orbital path). This criterion also creates a different standard for an object to be considered a planet, one that is based on size and distance: If an object is deemed too small and is too far away from the Sun, then it must not be a planet. Scientists opposed to the Resolution believe that dwarf planets should be categorized as a “true planet” in the same way that gas giants (e.g. Jupiter) and terrestrial planets (e.g. Earth) are considered “planets”.